Good stuff! There are some I'm familiar with and some I'm not. I'll put together a playlist of these and start checking them out. We could put together a PSW demo album, just in time for Christmas. New marketing slogan: "PSW Approved!" 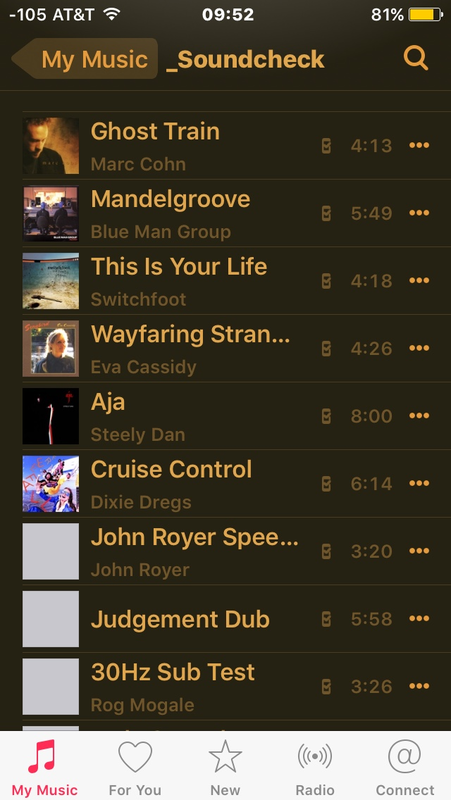 I don't buy much music on line, but perhaps a playlist and version of each song could be published. The issue is "which downloadable version am I getting?" One of our clients has promoter-supplied iThingy that is streaming music from something/somewhere. When the device identified itself as an iPod or iPhone the tracks were all very "one note bass". When the iThingy somehow became a desktop machine to the streaming service, the bass had much more fidelity and dynamics. I suspect the stream delivered to small personal devices is 'mastered' for ill-fitting ear buds being used in relatively noisy environments. With that in mind I'd much rather purchase music on CDs, rip to flac or wave PCM and put them on my Fios player's SD card. The song itself is just a start. If the version you get is all chopped and squashed, all the details get lost and what is great about the recording doesn't matter anymore. Agreed, the "Love" soundtrack has some good stuff on it. I have to admit I've not looked at their catalog in a while, but this album may just "fill in" for an official LAB listening collection. And most if not all their catalog are available as HiRes downloads too. Scroll down the track listing, lots of potentially good stuff to use besides the featured artist's tracks. I think though it's probably worth pointing out (someone normally does when these threads periodically pop up) that the songs themselves don't really matter as much as your knowledge of them. Of course it helps to have something that sounds good and is balanced and well recorded etc, and some of the suggestions on here are great sounding tracks. But at the end of the day the track itself isn't so important, the important part is that you should know the track inside out and back to front, and should know exactly what it should sound like when played through a good sound system. That way, if it doesn't sound the way you expect it to then you hear it instantly and can start to troubleshoot the problems. So the best idea is to pick a few well recorded tracks that you know well, even if they're different from other peoples suggestions, and work from them. Play them in all different sound systems and get to know if this part sounds a bit honky or if this part sounds a bit boxy etc what that actually means in terms of what frequencies may need some work, or what the problem areas may be based on what you're hearing.